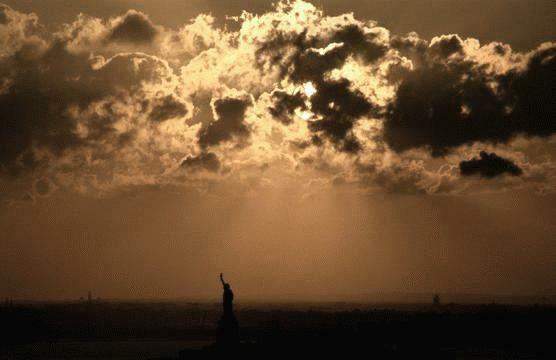 These ominous clouds dwarfing the Statue of Liberty were formed by the smoldering remains of the World Trade Center. This breath-taking daytime photo captures the darkened aftermath of that tragic day. My friend who was living in Brooklyn that day wrote the following heartfelt poem about it. I think it's one of the best I've read! sounds of fury gone awry. lives of loved ones gone this way. a shrouding veil of memory. ashes in the wind blew 'cross. as ashes in the wind this day. silent minds and hearts this way. more ashes in the wind to see. To visit my friend Frecs' terrific site, please visit... "THE REST STOP"
The photo titled "Liberty Under A Cloud" by Tom Dowling of Brooklyn, NY.